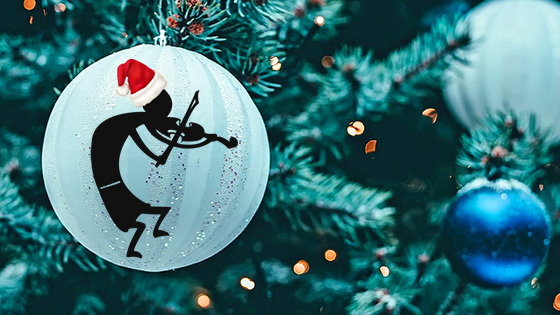 December 1, 2016, 4:48 PM · Gift-giving is one of the great joys of the holiday season, and each year we compile a list of some of the year's best new offerings from violinists for you to consider in your holiday gift-giving, gift-asking — and post-holiday loading of the iPhone, computer or other device. We hope this allows you to consider a music-related gift. We also would suggest considering supporting your local live music scene by purchasing tickets to local music events or simply making a year-end donation to a musical non-profit of your choice. I've tried to be inclusive, but I'm sure I have missed some ideas, so please feel free add your suggestions in the comments section. And yes, in this case, you are allowed to toot your own horn and recommend your own CD or book or product! You may also wish to refer to our gift-giving guides from previous years; I've listed links to those at the end of this blog. Many of the recordings below are linked to Amazon.com. Note that if you follow these links and make a purchase from Amazon, a portion of that will go to support Violinist.com. (If you would like to give a donation to support Violinist.com, click here.) I've also listed the artists' names in italics, and sometimes those are linked to stories we have written this year about them and their work. And whenever you buy any of these selections, from any source, you'll be helping to support the musicians and other artists who created them. Rachel Barton Pine's deep interest and experience with the music of the Baroque period informs her approach to the Sonatas and Partitas, which tends toward the period-performance norms of little vibrato and plenty of resonant open strings, capturing the musical language and dance gestures of these works. She plays with a Baroque bow on her modernized violin, the 1742 "ex-Bazzini, ex-Soldat" Guarneri del Gesù. Rachel Barton Pine at St. Pauls Church in Chicago. As Daniel Hope shared in an interview earlier this year: "My first memories growing up are musical memories of being in Menuhin's house, or in his rehearsals, or backstage. My mother would take me to work at his house, or his various houses, and let me play, surrounded by music." Hope calls the album a "portrait in sound," with works including Joan Tavener's "Song of the Angel" (a favorite of Menuhin's composed in 1994 for the 50th anniversary of the United Nations); Maurice Ravel's "Kaddisch"; Steve Reich's "Duet" for two violins; a new piece by Bechara El-Khoury called "Unfinished Journey," commissioned by Hope and the Gstaad Menuhin Festival to commemorate the 10th anniversary of Menuhin's death, and more. 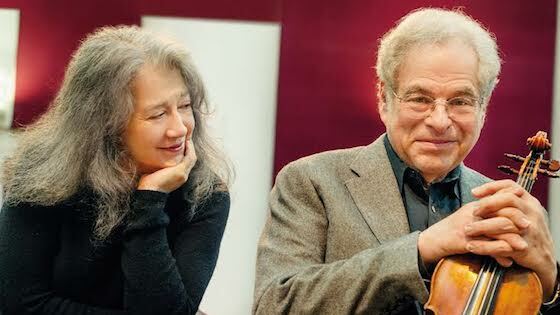 "My dream, always, was to perform with Martha," said Itzhak Perlman of this recording, in which he and pianist Martha Argerich perform Bach Sonata for Violin and Piano No. 4 in C minor; Brahms Sontatensatz in C minor; and Schumann Fantasiestücke and Violin Sonata No. 1 in A minor. "It's like having a conversation," Argerich said, "You get inspired by what you hear at a particular moment. There is an interplay, a lot of things happen -- it has spontaneity!" Martha Argerich and Itzhak Perlman. An astonishing collection of Yehudi Menuhin's life's work. Curated by French documentarist, writer and violinist Bruno Monsaingeon, it includes 80 CDs, 11 DVDs and a huge coffee-table book in three languages, full of Menuhin memorabilia such as photos, tour schedules, posters, concert programs, music pages, baby photos, handwritten notes. 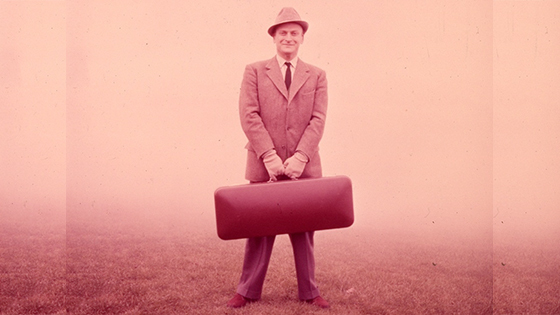 Yehudi Menuhin. Photo courtesy Warner Classics. Gil Shaham has recorded (and in some cases re-recorded) seven 1930s violin concertos with two albums released over the last few years: 1930s Violin Concertos, Vol. 1, with concertos by Samuel Barber (1939), Alban Berg (1935), Karl Hartmann (1939), Igor Stravinsky (1931) and Benjamin Britten (1939); and more recently, 1930s Violin Concertos, Vol. 2, with the second violin concertos of both Sergei Prokofiev (1935) and Bela Bartók (1938). Superstar violinist Joshua Bell teams up with Steven Isserlis and pianist Jeremy Denk to perform Brahms’s first published chamber work, the Piano Trio in B Major, Op. 8. The recording also includes the Double Concerto in A Minor, Op. 102 and the slow movement of Schumann’s Violin Concerto -- "it may be my favorite slow movement in any concerto," Bell says. 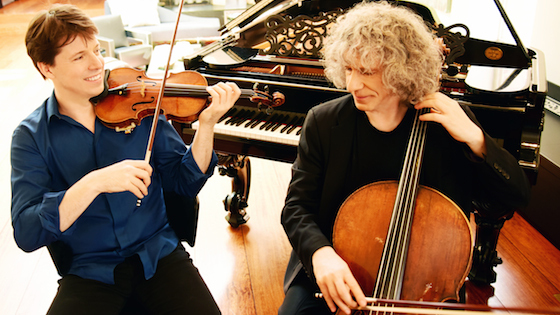 Joshua Bell and Steven Isserlis. Violinist James Ehnes certainly can trill, and who doesn't love the Four Seasons? Here's an album to enjoy both for Ehnes' technical display and for Vivaldi's ever-popular centerpiece of the repertoire. A Violin's Life, Vol. 2. 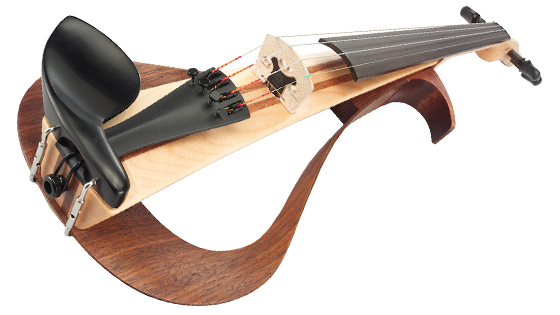 Here is a violin with a story, one that keeps unfolding! This album is a follow-up to Milwaukee Symphony concertmaster Frank Almond's 2013 album, A Violin's Life, an homage to the 1715 "Lipinski" Strad, which made international headlines when it was stolen, then recovered, in 2014. 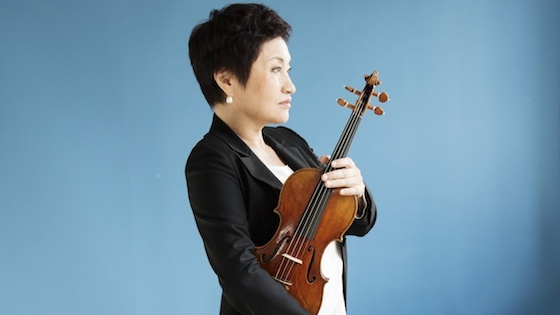 After returning to the concert stage in 2014, this is Kyung Wha Chung's first-ever recording of Bach’s complete works for solo violin, and her first studio recording in some 15 years. In 1994, Jennifer Koh won the top prize in the International Tchaikovsky Competition in Moscow. Though she has performed works of Tchaikovsky countless times live, this her first-ever recording of Tchaikovsky works. Besides the famous ("unplayable") Violin Concerto, it also includes Sérénade Mélancolique, Valse-Scherzo, and Souvenir d'un lieu cher (Glazunov's orchestration). 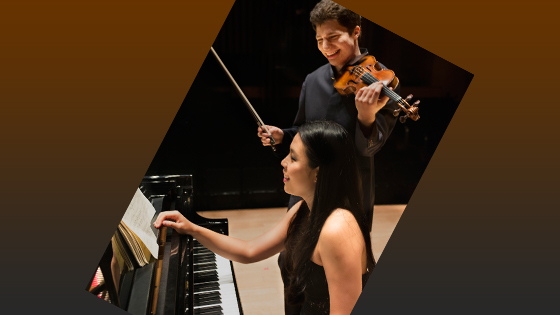 Augustin Hadelich and pianist Joyce Yang play the Franck Sonata, as well as André Previn's "Tango Song and Dance," written originally for Anne-Sophie Mutter; Robert Schumann's turbulent Sonata No. 1 in A minor Op. 105; and György Kurtág's "Tre Pezzi Op. 14e," a meditative piece that tells the performers to move to the next note when they are 'at peace" with the current one. Philippe Quint continues his exploration of Russian repertoire with this new recording of Alexander Glazunov's Violin Concerto, written originally for Leopold Auer; and Aram Khachaturian's Violin Concerto, written for Soviet violinist David Oistrakh. Do you long to relish in the deep tones of the viola? Here is the fifth and most recent release of "Violacentric" recital music composed by violist Scott Slapin, who is well-known in viola circles for his compositions that have been featured in the Primrose, Tertis, and ARD competitions and in performances by musicians around the world. The program includes short pieces, mostly viola duos performed by Slapin with his wife, violist Tanya Solomon. Here are the other albums in Slapin's "Violacentric" series: Reflections; All Viola, All the Time; Violacentrism: The Opera; and Violacentric Sonatas by Scott Slapin. Fischer's book breaks double stops down into their simplest components, with exercises that lead step-by-step to the end result: the actual scale. For example, if you are working on scales in thirds, he has devised 20 exercises, and only the last one is simply playing the scale slow and then fast. The book includes thirds, sixths, octaves, fingered octaves and tenths for all major and minor scales, and he explains how to do each exercise in detail. Jascha Heifetz called scales the "essential tools of violinists." 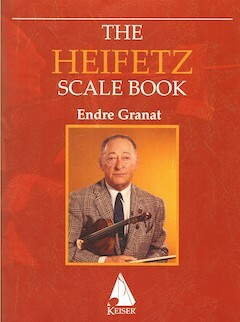 Endre Granat has put together a compendium of scales and arpeggios, as taught by Heifetz, who was Granat's longtime teacher. They include major, harmonic- and melodic minor scales in single notes, arpeggios, double-stops, trills, harmonics and left-hand pizzicato. There's a challenge in these for everyone! Everyone should have a Baroque bow! 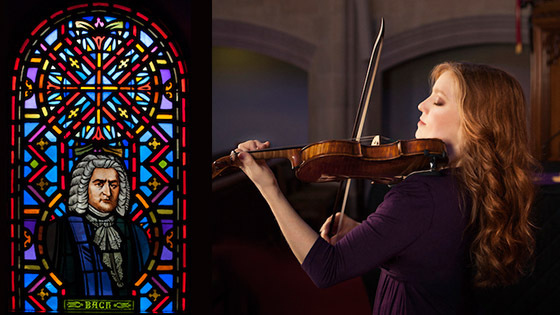 Rachel Barton Pine made that statement this year in our Violinist.com interview about her Bach recording. Ideally, get one from a great bowmaker, or your local shops; but she shared that it's also possible to buy a decent-playing bargain Baroque bow on Amazon for as little as $45. 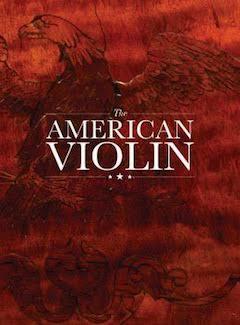 This is an arrestingly beautiful new book covering the evolution of the American violin from about 1750 to 1950, with high-quality photographs by Tucker Densley of about 100 instruments, front and back; as well as detailed research about the background stories of these makers. The book was a 10-year labor of love, a collaboration between the American Federation of Violin and Bow Makers and the Library of Congress, as well as other contributors. If you are a teacher who likes to accompany students on violin, this is for you: Atlanta-based violinist and arranger Martha Yasuda has made duet arrangmeent of quite a lot of student repertoire, including all the Suzuki books. For December she is offering a bundled deal where you can get seven books for $97; if you get the ones pictured on that page, you'll have duets for all the repertoire in Suzuki books 1-8, including the Handel Sonatas, La Folia and even with some extras like "Meditation from Thais."